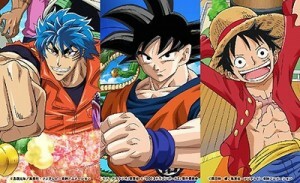 The cross over of anime legends Toriko, One Piece and Dragon Ball Z has just aired in Japan. With no immediate release date here’s the first part in Japanese. Being a huge fan of both Dragon Ball and One Piece it’s amazing to see them all together in one cartoon. Especially since they all live in totally separate universes usually. Saying that it would be awesome if one of the twelve universes Birusu talked about in Battle of Gods was the same as One Piece. Lets just hope we don’t see a cross over with Gantz, I love Gants but it could get very very messy. Unfortunatly there isn’t any news on when DBZ Battle of Gods will be released in English or even a fan dub but keep your fingered crossed we might see a similar upload soon.